Product prices and availability are accurate as of 2019-04-17 11:08:14 UTC and are subject to change. Any price and availability information displayed on http://www.amazon.co.uk/ at the time of purchase will apply to the purchase of this product. 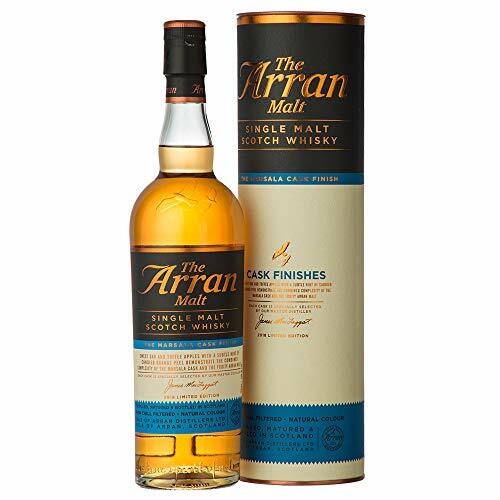 We are proud to offer the fantastic Arran Marsala Cask Finish 50%, 70cl. With so many available recently, it is wise to have a brand you can trust. The Arran Marsala Cask Finish 50%, 70cl is certainly that and will be a excellent acquisition. For this reduced price, the Arran Marsala Cask Finish 50%, 70cl is highly recommended and is a popular choice amongst many people. Isle Of Arran Distillers have included some nice touches and this results in good value for money. After initially maturing in traditional oak casks over a number of years The Arran Single Malt in this bottling was ‘finished’ in a selection of Marsala wine casks sourced from an artisan producer of this iconic Sicilian wine. Arran's Master Distiller, James MacTaggart, has carefully monitored this period of secondary maturation to ensure the perfect balance is struck between the Marsala casks and the intrinsic sweet-fruity character of The Arran Malt. The end result is a Single Malt with a decadently fruity, gourmet character, full of complexity and quality. "What a dram, one for a summer evening or indeed a cosy night in. Great exploration of the cask". Taste - Sweetness, Bitter orange, Apple, Toasted Oak.